I received an email from MyHeritage yesterday that highlighted many of their activities during 2017. It was a remarkable year for MyHeritage, in my opinion. 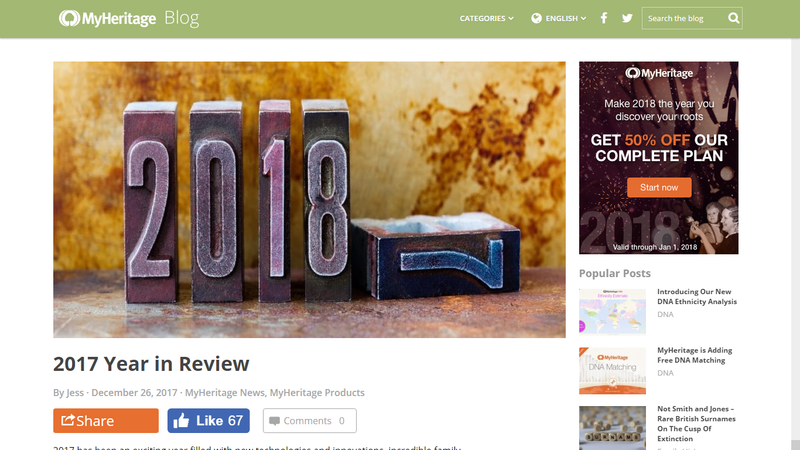 You can read the MyHeritage blog post 2017 Year in Review here. MyHeritage is offering a “New Year’s Resolution” campaign to encourage people to fulfill their resolution of finding more information about their family history, by enjoying a special 50% discount on the Complete subscription.To get the discount simply visit www.myheritage.com. They also added a fun holiday themed for your family tree! Falling snowflakes, colorful wrapped presents, hanging Santa hats, and fully stuffed stockings are now scattered around your tree. You can read more about this feature in their blog post. 1) In the last few days, MyHeritage released an extensive collection of U.S. Yearbooks, 1890-1979 (including mine!!! Who can find it?). This is one of the largest collections of digitized US yearbooks in existence, providing unprecedented genealogical coverage of individuals who went to high schools in the United States throughout a period of 90 years. Yearbooks are excellent genealogical records that include personal portraits and group photographs. MyHeritage is working on some amazing new technologies that will allow the extraction of even more value from the yearbooks and will be releasing those separately in the next few months. 2) MyHeritage announced that MyHeritage DNA surpassed one million people in the DNA database! They are already at 1.05 million. This grew very quickly from the 670,000 figure they announced in the middle of November. The one million is roughly comprised of about 80% MyHeritage DNA customers and 20% of people who uploaded DNA data from other DNA services. They are proud to be the fastest company to get there, i.e., the company that took the least time to reach the size of one million people from the launch of its DNA product. What does the fast growth mean to you? That on MyHeritage DNA, you will have an excellent chance to be matched to other people who are not using any other DNA service, especially leveraging MyHeritage strong international coverage outside the United States due to its availability in 42 languages. MyHeritage is working on a major revamp of the matching algorithms which will correct old problems, add a preliminary Chromosome Browser and put accuracy at an unprecedented high level, and this will be released in early January 2018. All of this is good news for genealogists and family historians - MyHeritage is one of the four major players on the genealogy stage, and is innovating and growing every year. Competition for your genealogy dollar is a good thing - it keeps the commercial prices low, fosters innovation, and adds additional databases for researchers. I found myself in the Yearbook collection, too, but I don't have a subscription, so I couldn't look at it. I also found two of my dad's sisters. I plan to visit a FHC next week and check this out!